For decades and centuries even, one would have to have a beard or at least a mustache in order to truly be considered a gentleman. After a few decades of going back and forth regarding the ‘classic’ male appearance, the beard trend has yet again risen to prominence. In every magazine and on every red carpet, there are men sporting thick, yet stylized beards. They simply ooze manliness, style, and confidence, so it’s no wonder that more and more men tend to their manes with special care. However, not everyone has the time, patience, or the money to visit the barber and enjoy an immaculate beard-shaping experience. That’s where beard shaping tools came into play. In order to achieve a perfect beard line, it’s necessary to find a good beard shaping tool that will help you groom and maintain your beard with ease. Not many of us are born with the talent to achieve perfect symmetry with free-hand moves. It takes a lot of experience, practice and a sense of aesthetics to do that. It’s really difficult to practice on ourselves, because, let’s face it – if you make a mistake, chances are you’re going to have to shave and start growing your beard from scratch. Luckily, a good beard shaping tool will help you figure out the exact shape and achieve perfect lines while shaving or trimming your beard, all without having to visit the salon. The best thing about these tools is that they’re easy to use; although that’s not to say you won’t need any practice whatsoever. The trick is to find a perfect beard shaping tool for your face shape and beard type, as well as the beard style you’re looking to achieve. 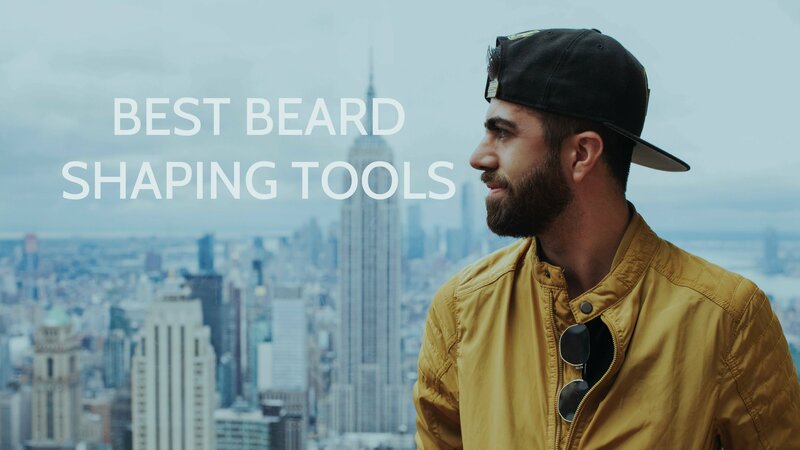 Read on to discover the best beard shaping tool on the market, lots of beard shaping tool reviews, different ways to accomplish your desired beard style, what materials and shapes are best for your beard, as well as the shaper tools price and some tips on the side! Our winner is the amazing Aberlite beard line up tool – it will really make your beard tidy and clean-looking with very little practice! Its unusual shape might be intimidating at first, but with the detailed instructional video that’s available online, every shape and curve will become clear in an instant. This beard liner tool gives you the opportunity to choose between various beard designs, starting from classic cuts to modern, sleek edges. Its elongated build allows for easy trimming for any face shape out there. With the Aberlite, you can achieve great beard or hair fade styles, make straight or curved cheek likes, a crisp and sharp neckline as well as shape your goatee lines and sideburns. It’s made of transparent, sturdy plastic and high-quality rubber in the center, making the shaper durable and shock-resistant. The rubber gives a firm grip due to its anti-slip properties and will keep the shaper steady while you design your new beard look. While the transparency may seem like a modern design and nothing more, it actually comes really useful in placing the shaper on the right spot, because it’s easier for you to see the line you’re making and correct it if need be. Along with the beard shape up tool, you also get a white professional barber pencil. For those of you who are unacquainted with barber pencils, they’re used to draw the desired beard shape by following the lines of the beard liner tool, so that you can assess if that’s the style you’re going for, and if everything is symmetrical, before actually trimming the beard. If you think there’s room for improvement, you can simply wipe it off and start drawing again. Because most beards vary in color from dark blonde to black, the white will stand out on almost any face, making it super-easy to outline the shape of your beard. Another perk of this beard line up tool is the thin, smooth edge, which allows for your razor/trimmer to reach the last one of the hairs, without bumping into the shaper edge and leaving you with a messy beard line. The multiple shapes you can achieve with it will leave you needing fewer beard accessories than ever, so if you’re not a fan of bathroom clutter – this is the perfect product for you. Our second best beard template has to be the old-school Beard Command. This multifunctional set is a perfect gift, not only because of its functionality but because of its stunning look and natural feel as well. The set comes with a Boar bristle bamboo wood brush and a two-in-one shaper that doubles as a comb. The brush features two types of boar bristles – soft and hard, allowing your beard-styling to become an everyday activity. Who doesn’t like to brush out their beard when they have a tool as good-looking as this brush? It will do a great job of smoothing-out your beard, and it’s ideal if you want to spread beard oil or a beard conditioner evenly throughout your beard! 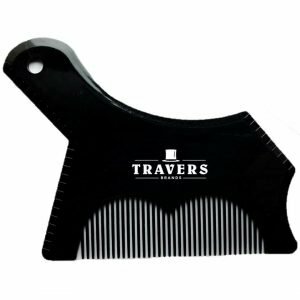 The premium wood comb that’s positioned on one side of the shaping tool is ideal for grooming all types of beards, except for really curly or really thick ones. The whole product eco-friendly and 100% biodegradable, which is good to know if you’re looking to lower the use of plastic in your everyday life. 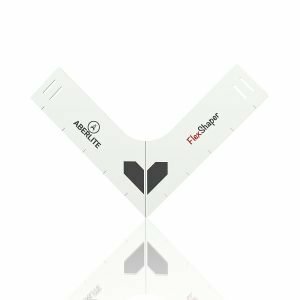 The beard shape up tool will help you style your sideline, cheek line, jawline and neckline like a pro, although, like any other beard liner, there is a learning curve involved in this process. The ergonomic design will make it easy for you to hold it in place, but even so, some users have reported that it took them 4-5 tries to achieve the desired look. While wood is an elegant material, its benefits don’t end with just its looks. As you may know, hair and plastic can cause some static electricity when they come in contact (this usually happens with cheaper plastic), but this will never happen with this wooden set. Plus, while this is a two-piece set, it’s not bulky at all, and it can be packed in any smaller-sized bag and become your trusty, modern travel companion. The third on our Top 3 list and the best beard shaping tool when it comes to simplicity and minimal design is the Beard Black styling tool. This facial hair liner will help you to style your cheek line, neckline, jawline, mustache, goatee, and sideburns. 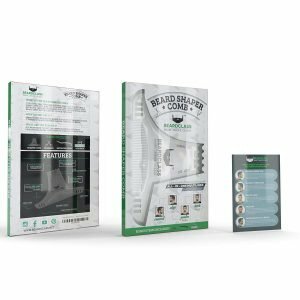 It might seem like a lot of things to do with such a simple tool, but it comes with a comprehensive grooming kit guide that will get you professional-looking results in no time. A novelty feature of this beard shaping template is its measurement pointers, square-shaped holes on both sides of the plastic, which allow you to reference the beard line position on one side of your face and compare it to the other side so that achieving symmetry comes fairly easy. There are also an extra 2 combs on each side of the shaping tool so that you don’t have to angle it awkwardly or change your hand position while combing through your beard. This will ensure that your beard looks perfect every day, in just a matter of seconds! The minimalistic, compact design makes this the most travel-friendly beard liner tool yet. The thin edges ensure that the razor/trimmer will cut the hairs close to the edge, enabling greater precision when creating a beard line. Due to its smaller size, though, using this template might be more difficult for those who have a slight rounder, bigger face. That’s not to say it’s impossible, it’ll just take a few times to figure out all the angles and positions. One downside of this tool is that it’s opaque, meaning it doesn’t allow you to see if you’re trimming right, or if you’ll end up with a messy, asymmetrical line. One way of fixing this is buying a barber pencil on the side, or just getting a vibrant makeup crayon and using it instead of the pencil. This Aberlite beard shaper is the best beard shaping tool for those looking to get a perfect neckline shave. Creating a neat neckline can tidy-up the whole appearance of your beard; it can really make all the difference. The key thing to avoid when creating a neckline is to avoid shaving too high and disturbing the jawline region. The innovative Aberlite FlexShaper will help you create a natural, precise beard neckline by holding the tool in place while you trim! There are two different headbands that come in the pack, and both can be adjusted to the flexible beard neckline template. One headband is black (0.9 mm thick) and the other is white and is a little bit tighter (1.1 mm thick). By holding the tool firmly in place, the headbands will allow you to trim with both hands, resulting in greater precision! 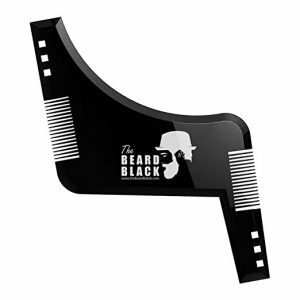 The flexible beard shaping template is made out of high-quality plastic that’s going to last you a long time. You can adjust the position of the shaping tool on your neck until you’re completely satisfied with the shape of your neckline. The material will conform to your neck shape, ridding you of the sometimes stiff feeling the other shaping tools can give. With the flexible shaper and the elastic headbands, it’s no wonder that this beard shaper is designed to fit any neck size. If you’re confused as to how exactly to use this tool (we don’t blame you), there are detailed instructions available online. If you’re planning on growing out your beard long, you might not need to use this tool to achieve the perfect beard line every time, especially once the beard grows out a bit, but it can be a true savior when you’re trying to shape your 3-day stubble. Some users have stated that they have a hard time getting a straight line with this tool, especially under the ear, but this seems to primarily be the problem the first few times you use it. You’ll definitely get a hang of it as time goes by. 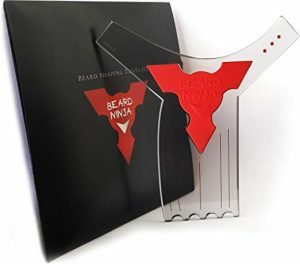 If you’re searching for the ultimate, multifunctional beard shaping template, look no further than the Beardclass beard shaping tool. This 8-in-1 multifunctional shaper can truly do it all. It can help create a curved cut, step cut, sideburns, curved and straight goatee or cheek line, and a neckline edge. To top that off, this beard liner tool features a wide, full-size comb. It will help you straighten your beard before shaving, making it easy to achieve precision lines. The shaper also boasts a 1mm technology all-around, making every side of the tool paper thin. This enables any razor/trimmer to glide along the edges of the shaping tool with almost no gap between the tool and the beard line. However, some users have noted that the thin feature is making the whole tool pretty sharp on the edges, which makes shaving uncomfortable at times. It is almost completely transparent so that you can see where you’re trimming and correct the tool’s position along the way. It comes in three available colors: clear (which might be a bit hard to find if misplaced), green and blue, all of them transparent. It’s made out of fairly strong, plastic material. Keep in mind that while it has many perks, this beard shaping tool isn’t suitable for long, full beards and ‘larger’ faces. It works best with shorter beards and ‘smaller’ faces. 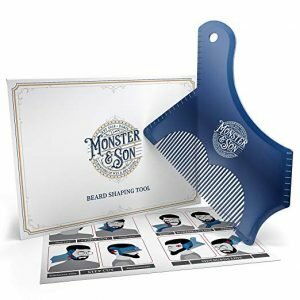 Another in the line of multifunctional tools, the Monster&Son beard shaping tool boasts a wide comb suitable for longer beards and a beautiful design as well. Due to its bigger size and comb width, a comfortable grip and easy handling are practically guaranteed. Similarly to the Black Beard styling tool, this one also has leveling marks that serve as a reference in achieving a symmetrical look. For those that are inexperienced in handling a beard shaping tool, there’s a user guide in the package that will explain the whole process in no time! The semi-transparent color might seem confusing at first, but it serves its purpose well. It’s transparent enough so that you can see the hairs beneath the shaping tool, but it’s tinted just enough so that you don’t lose track of the positioning of the beard line. The tool can be flipped around and used to achieve many different cuts: curve, step, sideburn, curved and straight goatee, straight, precision mustache and neckline. For those who want to have a stubble or a short beard and not grow it further, this practical, multifunctional beard shaping tool might be just what you’re looking for. The compact and ergonomic liner tool’s edges will help you shape your cheek line, neckline, jawline, mustache, goatee, and sideburns. It’s almost the same shape as the Monster&Son, except it’s completely opaque and the comb isn’t as wide. Due to its lack of transparency, it might be a bit harder to get used to using this template, but it makes up for it with leveling marks, It features chamfered edges so that getting up close to the shaper tool is really easy. 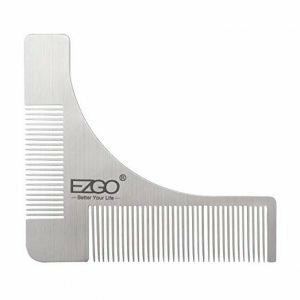 Perhaps the most beautiful beard shaping tool of the bunch, the EZGO stainless steel beard styling template is a minimal masterpiece. It boasts great design, a styling template with curved and straight edges, and 2 combs as well. The combs ensure that any beard can be subdued and styled without much effort, and they do a great job of spreading beard oil. However, some customers have stated that the metal comb ends up pulling on their beard hair follicles. This may be due to the specific type of beard, so, unfortunately, you won’t know if the combs suit you until you try them. The rounded edges provide a greater level of comfort while shaving, and its light weight makes this a great travel beard shaping tool. It can be used for neckline and cheek line, sideburns, mustache, jawline, and goatee. Some users have noted that its shape makes it limited in options and that in order to get a crisp edge, you’d need to slide it down a bit, risking an asymmetrical-looking beard as a result. There is no question that this beard styling tool will last you a lifetime. However, if you’re planning on sporting a beard for a long time, it might be wise to invest in a bit more complex beard shaping tool and keep this one as a trusty second. 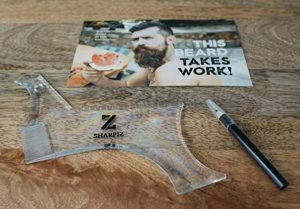 The Sharpiz beard shaping tool is a multifunctional shaper + comb tool on paper, but in all sincerity, the comb is way too narrow to be able to glide through even a medium beard. However, if you’re donning a mustache, this could be a very useful feature. The shape of the Sharpiz tool is a bit more complex, allowing for greater variation in beard shaping. With it, you can shape your cheek line, neckline, jawline, mustache, goatee, sideburns, and also cut head and neck hairline as a part of the haircut. It’s transparent (which is a plus) so it allows for a precise shaving, especially because it comes with a black pencil, which you can use to draw the desired outline of your beard before trimming it. The obvious downfall of the pencil is in its color, which most likely won’t be suitable not only for men with darker beards but for men of color as well. 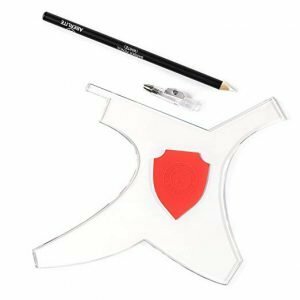 Its design is ergonomic and provides a firm grip, and the shaping tool also features ear and nose leveling marks and thin edges. The package comes with the styling tool, the black barber pencil, and a grooming guide with tips. However, some customers have noticed that despite these cool features, this beard shaping tool isn’t suitable for people with softer, rounder cheeks, as it’s too rigid and completely flat, making it difficult to press it comfortably against the face. And last, but not least, we’ve come to the Beard Ninja, the final of our top 10 beard shaping tool reviews. This 8-in-1 multi-liner tool features a complex shape which enables a curve, step, straight cut, a straight goatee as well as an outward curved one, sideburns, mustache, and a perfect neckline. There are also some pretty useful printed guide marks on the transparent edges, which make achieving the symmetry a breeze. In the center, there is a silicone, anti-slip grip that enables good control and comfort. Additionally, you get a pdf e-book with different information regarding beard-growing styles and a tutorial on beard-sculpting. Similarly to the shaping tool before it, the Beard Ninja fails to provide a solution for round-face men, due to its lack of flexibility, but nevertheless, it is a great beard shaping tool, especially at its price. The internet has given us so much free information, it would be silly of us to presume there isn’t loads of videos and tutorials about what the best beard shaping tool is and how do you find it. There are so many beauty gurus around that are primarily concerned with female beauty, that the idea of male beauty and different grooming products has been left behind. Fortunately, things have started to change, and the time of men’s beauty products is on the rise. Let’s get one thing straight – the best beard shaping results are achieved by a professional barber, who has shaped and groomed thousands and thousands of beards in his lifetime. Whatever you do at home, there’s no way you can match the precision of a barber. But on the other hand, the question is: do you really care? Is having a well-groomed, clean-cut beard, that isn’t absolutely perfect, better than having to go to the barber’s, and pay a substantial amount of money for something just slightly better? Our guess is that the answer is yes – it’s better to do it at home at a fraction of the price and in a lot less time. Beard shaping tools are usually multifunctional, compact tools with differently-shaped edges that make styling your beard at home a piece of cake. Well, over a period of time, at least. There is a learning curve to these tools and unfortunately, no matter how much you try, there are no shortcuts. Learning to use a beard shaping tool will require some trial and error; however, it shouldn’t mess up with your beard so much that you have to shave it and start growing it again. But be prepared for some questionable lines along the way. The key to finding the perfect beard shaping tool for yourself is to appropriately assess your needs, including your beard type, the desired style, your willingness to upkeep it regularly, etc. This all has an effect on the type of beard styling tool you choose. Each shape, material, and function has some useful aspects to them, but also some downsides as well. Design-wise, beard shaping tools are simple, compact and practical. That being said, this design still allows for a lot of diversity, primarily in the materials and colors used, so that each man can choose a shaping tool that is in line with his aesthetics. Beard shaping tools range from an old-school design that would be suitable for a gentleman from the ‘50s to a more modern, seamless design suitable for a millennial or a gen-X guy. When choosing the best tool for shaping the beard, it’s important to choose one that you genuinely like. After all, you are going to use it for a long time after you purchase it – they tend to be durable and you won’t be able to get rid of them easily. Try to think of a particular color you like or the environment in which you’ll most often shave. Pick a beard shaping tool that will fit in seamlessly into your bathroom vibe and design, and try to combine its color with the color of your razor/trimmer – that way, they will seem like they have come in a set. Before deciding on buying the beard shaping tool, let’s cover some key aspects. Beard shaping tools are usually very simple and usually consist of the shaping tool and a comb, while some shaping tool sets also include a brush. The tool itself is reminiscent of a triangle, with a round, inverted edge. This edge allows you to shape the cheek line of the beard, and make a clean cut below your cheekbones down to the corner of your mouth. While the triangular shape is the most basic of all, there are other various-shaped beard shaping tools that enable much more beard-shaping options by combining straight and curved lines that are both short and long, as well as angled differently. This way, you can experiment with different beard style and even some haircuts, because luckily, most of these tools come with some kind of instructions on how to style your beard. The comb is usually a part of the basic beard shaping tool, making it multifunctional. It’s placed on the side (or sides) of the tool and, depending on the width and material, it can be suitable to glide through either thin and short beards or thick and long ones as well. The teeth of these combs are often thin and narrow, which can cause some difficulty to those with thick beards. Another option when it comes to beard combs is to get a separate comb, either as a part of a beard shaping tool pack or separately. This could be a wise move for those with thicker, longer beards because the teeth of these combs are often sturdier, stronger and more capable of gliding through those types of beards. A brush never comes as a part of a multifunctional tool, but rather as an added part of the beard shaping tool pack. It can be very useful for smoothing out the beard and spreading product such as a beard conditioner or beard oil evenly throughout the beard. The important thing to note is that beard shaping tools work best when paired with high-quality razors and trimmers because those can adhere to the skin better and give you better results when paired with a good beard shaper. Also, a beard shaping tool makes for a great gift. It’s not that hard to choose the right one, and it’s a great surprise for a birthday, father’s day, Valentine’s Day, Christmas, or any other holiday you wish to show your love to a special man in your life. When choosing the best beard shaping tool, consider the things you already have in your beard grooming kit. Do you already have a comb? Well, then you don’t need a multifunctional shaping tool and comb in one. The same goes for the brush. If you already have one, then there’s no actual need to pay for a kit that has another one – aim for a single product to spend a few more dollars on. There are also some other important questions to take into account when choosing the beard shaping tool. Will the materials suit my needs? Can I achieve the beard style I’m going for with this product? First of all, let’s take a look at the 3 main materials used for most beard shaping tools on the market. Although it seems elegant, keep in mind that wooden beard shaping materials will come in contact with razors, trimmers, scissors, etc. This means that it will quickly become a little scratched if you’re not especially careful. This doesn’t mean that it will lose its functionality and sturdiness, but its classy looks will quickly deteriorate. Also, it’s always better to have a transparent beard shaping tool, at least for beginners. This could be rectified by buying a barber’s pencil, but if you’re a one-size-fits-all kind of person, you most likely won’t be willing to bother. Metal is the most durable material when it comes to beard shaping tools. The good thing is that it will last you a lifetime. The bad thing is that it isn’t transparent (again, can be irrelevant if you don’t mind using a barber’s pencil) and that it’s usually very cold to touch, so a lot of men simply don’t like the touch of metal on their cheeks first thing in the morning. Plastic is a good option and the only one that offers transparency as a feature; however, it’s the least durable of all. This doesn’t mean that it’s going to break easily, just that it could break the easiest. Plastic beard shaping tools are lightweight, and they won’t scratch or chip as easy as the wooden ones will. One great thing about them is that they’re often transparent, making it really easy for you to see the line you’re trimming and adjust the tool to achieve perfect symmetry. This makes the plastic beard shaper the best beard template for beginners and those who don’t want to grow a long beard but would rather prefer to upkeep a stubble. Depending on the complexity of your beard and all the details you care about, the next thing you want to pay attention to are the various shapes of the beard shaping tools. The best thing to do is to find a tool that has two curved edges and several different straight ones, which would enable you to experiment with whichever look you want to. The more various edges a tool has, the bigger the chances of pulling out every look you imagine. Keep in mind the comb and whether you need it on one or even two edges of your styling tool. A comb will help you with trimming and styling, but don’t put too much hope into these smaller combs if you have a thicker beard. As most simple products, the great thing about the shaper tools price is that they’re cheap. Almost all of them cost less than $20, with a good chunk of them costing even below $10. This means that you can get yourself fully equipped with a professional beard grooming kit for the same amount of money you would pay your one visit to the barber! When growing out your beard long, you might be in a hurry to try out that beard shaping tool you just got. Hold it! Leave your beard alone for 6-7 weeks. Let it grow without any trimming or styling. This way you’ll be sure that all the hairs have grown out. Only after that time has passed, you can start slowly shaping it into your desired style. Expert tip: If your beard is hard to tame, try combing some beard oil through. The hair on the beard isn’t as oily, and the lack of oil can make it look scruffy very easily. Putting oil in your beard will make it easy for you to shape and smooth it to your liking. Did you know that combing your beard regularly eliminates ingrown hairs, and supports a healthy beard growth? Yeah, turns out, it’s never just about the looks. If you’re keen on using a wooden or metal beard shaping tool, but you’re not 100% sure that the end result will be symmetrical, consider getting a barber pencil. They’re useful, and they’ll make you look like a real pro. 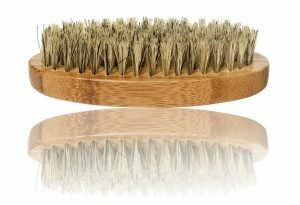 Also, if you’re not that into styling your beard, but you enjoy combing through it, check out this sandalwood comb – it works for both thin and thick beards, and it looks really nice. Living with your beard shaping tool is easy, the only thing you have to do is wash it with lukewarm water from time to time, and clean it of any leftover hairs. Other than that, the only reason to get another one is if you want to try a new style that you can’t achieve with the one you already have. We’ve talked about the top 10 best tools for shaping your beard, their pros and cons, and we hope we’ve made a comprehensive guide to finding the perfect one for you, what functionality you should pay attention to and what materials to choose. The only thing left for you to do now if grow out that beard and pick a style.